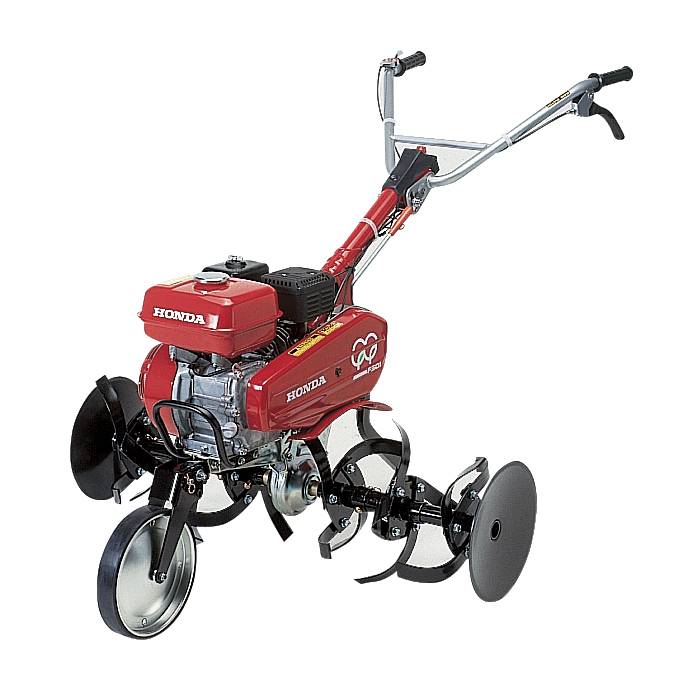 Don't let the small, lightweight style of the Honda F501 Medium Front Tine Tiller fool you. It is powerful enough for tough jobs and will easily meet all of your expectations. The easy starting Honda commercial OHV engine offers superb power for digging in tough conditions. This durable engine also offers easy starting, quiet operation, lower emissions and easy refueling. The F501 will make quick work in a variety of areas. This tiller's gear drive transmission offers 2 forward speeds and 1 reverse speed. The commercial grade transmission also provides long tiller life with less maintenance. Low maintenance, yet extremely effective, the Cyclone air filter uses a special cup to separate debris and dust. The convenient handle mounted controls allow for easy access for both tine and drive wheel engagement. Adjust the tilling depth for optimal performance, and the handle position up or down for a comfortable operating height. Storage is simple and space saving due to the folding, heavy duty handle.